Summary The three-dimensional organization of the genome is essential for development and health. Although the organization of euchromatin (transcriptionally permissive chromatin) dynamically adjusts to changes in transcription, the underlying mechanisms remain elusive. Here, we studied how transcription organizes euchromatin, using experiments in zebrafish embryonic cells and theory. We show that transcription establishes an interspersed pattern of chromatin domains and RNA-enriched microenvironments. Specifically, accumulation of RNA in the vicinity of transcription sites creates microenvironments that locally remodel chromatin by displacing not transcribed chromatin. 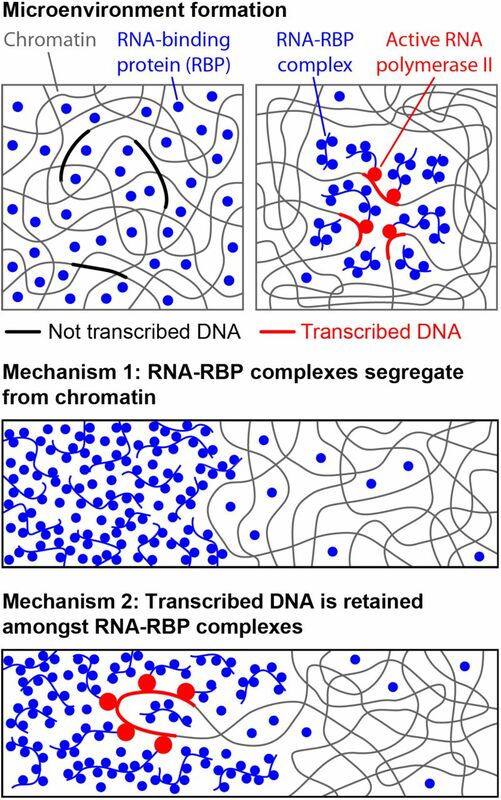 Ongoing transcriptional activity stabilizes the interspersed pattern of chromatin domains and RNA-enriched microenvironments by establishing contacts between chromatin and RNA. We explain our observations with an active microemulsion model based on two macromolecular mechanisms: RNA/RNA-binding protein complexes generally segregate from chromatin, while transcribed chromatin is retained among RNA/RNA-binding protein accumulations. We propose that microenvironments might be central to genome architecture and serve as gene regulatory hubs.